A visit to Alaska is never complete without taking the iconic Portage Glacier Cruise Tour. It leaves from Anchorage and takes about an hour to drive to one of the best Alaska glaciers in action. Here’s why it is worth carving out time for a visit to Portage Glacier during your stay in Alaska. Portage Glacier, located within the Chugach National Forest, once filled the entire 14-mile stretch of the Portage Valley, shaping its very landscape. Catch some hiking trails from the Begich, Boggs Visitor Center for a chance to see scenic vistas, but don’t expect to see the glacier here. It has retreated beyond visibility, fueled by climate change starting a century and a half ago at the end of the Little Ice Age. Still, the center is one of the most popular in Alaska, offering interactive exhibits, information on camping and bear sightings, and expert interpretation on the glacier. Plus, you can see this ancient powerhouse via the Portage Glacier Tour, which brings you within 300 yards of the 10-story-tall glacier on the mv Ptarmigan. It is the best way to see the glacier up close. From the safety of the mv Ptarmigan, glacier groupies might get to watch the Portage Glacier in motion. The glacier is still retreating, meaning it’s receding from its original termination point. In fact, U.S. Geological Survey information shows it has receded nearly five kilometers in the past century. The retreat is caused by ice “calving,” or unstable ice breaking off of the glacier into Portage Lake. You might have the chance to witness this spectacular natural phenomenon. While the glacier has reached a more stable position, it continues to calve, allowing visitors to see one of nature’s most dramatic natural events in real time. Get insider knowledge about the glacier straight from the folks in the know. The one-hour cruise operates within the Chugach National Forest on the rugged Kenai Peninsula under a special permit from the USDA Forest Service. The Portage Glacier Cruise is narrated by a National Park Service employee, who will interpret the scenic vistas for you. 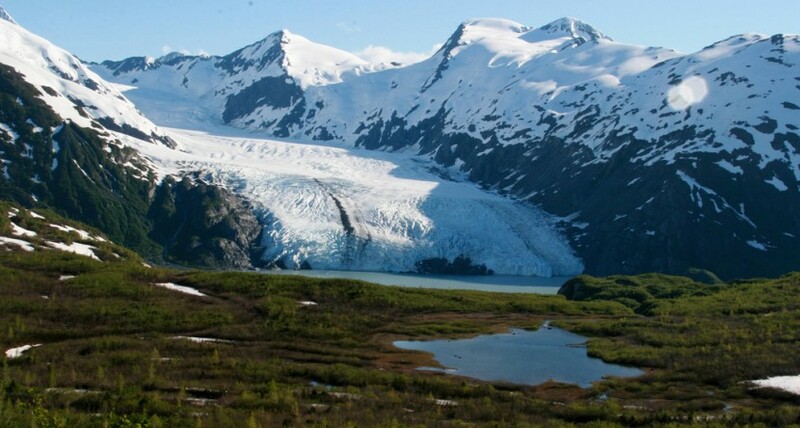 You’ll get to know all about the wondrous features and history about the Portage Glacier, including how it has shaped the landscape around Portage Pass, a historic trade route between Turnagain Arm and Prince William Sound. The 80-foot mv Ptarmigan, built to U.S. Coast Guard specs to ensure minimal impact on the nearby ecosystem, is the only boat that operates on Portage Lake, navigating without trouble around the mini bergs floating in the water. The boat, which holds up to 144 passengers, includes a fully enclosed, heated cabin with large windows so you can see the sites without chattering teeth. If you would rather get the full experience of Alaska’s brisk air, the mv Ptarmigan includes a topside viewing deck: The very best place to observe the glacier calving. 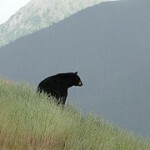 During the tour, you’re likely to see wildlife such as migrating waterfowl or maybe the occasional bear or moose. But the Portage Glacier Cruise Tour also includes a visit to the Alaska Wildlife Conservation Center in Girdwood, giving you a guaranteed chance to experience Alaska’s wildlife up-close and personal way. The nonprofit center is dedicated to aiding Alaska’s wild creatures, including through conservation, education and quality care of injured and orphaned creatures, some of whom have a permanent home at the center. 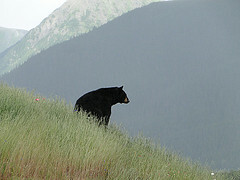 The center offers the opportunity to view the natural behavior of animals such as coyotes, musk ox, bears, and eagles. Bring your cameras. Wildlife experts at the Center have partnered with the Alaska Department of Fish & Game to reintroduce to the wild the wood bison, a species once thought extinct. Way to go, wildlife people. Now that you’ve got the scoop on Portage Glacier, you’ve got one idea about what you must see when you visit Alaska. All Princess Lodges locations can help you plan the rest of your visit to the Great Land or check out the other Alaska adventures you could have during your visit on the Alaska tours page. Main photo by Frank Kovalchek.